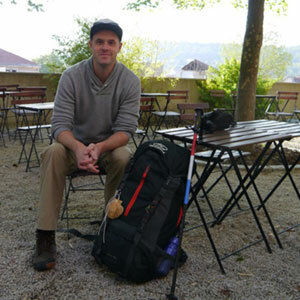 Blogger Tom Caley from IndieLifestyle.net reflects on his glorious trip on the Via Podiensis, the French Camino, where he found unspoilt beauty and a few new friends. Say ‘Camino’ to most people and they’ll automatically think of Spain. The famous Camino Francés, popularised by films like The Way with Martin Sheen, and books like Paulo Coelho’s The Pilgrimage, now draws thousands of walkers each year. Looking to take on a trek earlier this year, I too imagined myself as one of these modern-day pilgrims. After a little research though, I was surprised and delighted to learn a ‘Spanish’ Camino was not the only option. In fact the traditional starting place for most pilgrimages – St Jean Pied-de-Port – is only a convergence point for the many ancient paths that come through Spain’s nearest neighbour. My eyes were drawn on a map of Europe to a place called Le Puy-en-Velay in France. This small medieval town in the Haute Loire is the starting place for a pilgrimage route called the Via Podiensis (also known as the Le Puy Camino or Chemin du Puy). Like the Camino Francés, this country ramble measures around 750km in length, has good walkers’ accommodation options all along and is steeped in history. The decision, of course, was made pretty quick, and in late May I found myself standing on the steps of the cathedral in Le Puy, backpack firmly lashed on. The next 5 weeks would take me through deepest, darkest, most beautiful France. I could go on for days about the beauty of the Via Podiensis route. A ‘true classic’ for outdoors lovers, this little-known version of the Camino carefully avoids all but the most picturesque and atmospheric of French towns and villages. The route is designated a National Trail, or Grande Randonée, and much effort is put into its maintenance and infrastructure for walkers. In the first week the trail goes high – up to 1300 meters – as you wind through high forests, sweeping plateau and among broken rock and limestone scars. 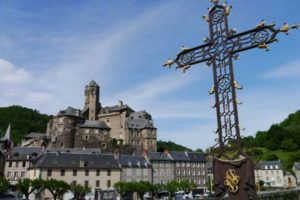 UNESCO-protected towns such as St-Côme d’Olt, Estaing, and Auvillar will leave you speechless. Larger places like Moissac and Cahors still have Gothic medieval cathedrals, 1000-year-old cloisters and bridges built in the 13th century. The experience of being a pilgrim is at once strange, delightful and life-affirming. Having travelled a lot in my time, I’ve seen a lot, but nothing quite like this. Your trail buddies come from all nations, speak all languages and may be young, middle-aged, or retirees. None of this matters though – whoever is on the trail is a fellow pilgrim. You share epic conversations and frank admissions of your hopes, fears and dreams – all set against the most stunning unspoilt backdrop. People who were complete strangers an hour ago quickly become friends. If ever your faith were shaken in humanity, a pilgrimage is the place to reaffirm it. While the Via Podiensis route is well-known in France and some parts of Europe, people from other countries frequently express anxiety over whether it’s ‘do-able’. The answer, of course, is a resounding ‘yes’. Costs of food and accommodation will set you back more than in Spain, but the frugal may still enjoy wonderful weeks of walking on a respectable budget. Walkers hostels – called gites – come in municipal and private form. In the private ones, you’ll be cooked for, given wonderful rooms in an old house or converted granary and provided with a grand breakfast before your morning departure. Practically speaking, this French Camino is completely set-up for long-distance walking. Time to reflect, time to make friends, a glorious month in the countryside, a tour of France’s medieval history. All of this is yours is only you’d get to the starting line. I often think back to my time on the trail with a smile. I made it as far as Pamplona before returning home. Maybe one day I’ll finish what I started and make it to Santiago… for now I can dream. That’s the thing with a pilgrimage – it always stays with you in mind and spirit. Tom Caley walked the Via Podiensis from May to June 2016. His travel and personal development website is called IndieLifestyle.net. You can also catch up with him on Twitter or on Facebook. Hi Peter, thank you for your tips and advice. We agree with all 3 points. It is important to be prepared for the walk ahead. Kindest wishes, Lisa from CaminoWays. 1. Be physically and mentally prepared for the challenge. I strongly recommend buying a pair of Pacer walking poles. Buy your boots and pack well in advance and have them well worn in advance. 2. Purchase a lightweight pack no bigger than 48L capacity – that way you won’t exceed 10kg. Before you leave, unload your pack 3 times and leave something behind each time you re-pack. Don’t take electronic gear other than a smart phone and charger. 3. Each day on your pilgrimage don’t calculate how far to the end – concern yourself only with getting to your destination at the end of each day. There is only one section of the Camino Frances where you will need to walk 30km – otherwise limit your daily distance to 18-20km. That way you wont’t get injured and you won’t become exhausted. Thank you for the suggestion Edward, we might add it in the future. Kindest regards. What aboit Polisk Camino Ways? Marketing Manager Maria is from Viveiro, in the misty and beautiful northern coast of Galicia. She adores Santiago, where she studied Journalism at Santiago de Compostela University. She also loves good food, travel and all things arty crafty. She has walked and cycled many trails, from Ireland to Japan.